The Cooperative Intelligent Transport Systems (C-ITS) represents an ever growing place in the sector of transport. 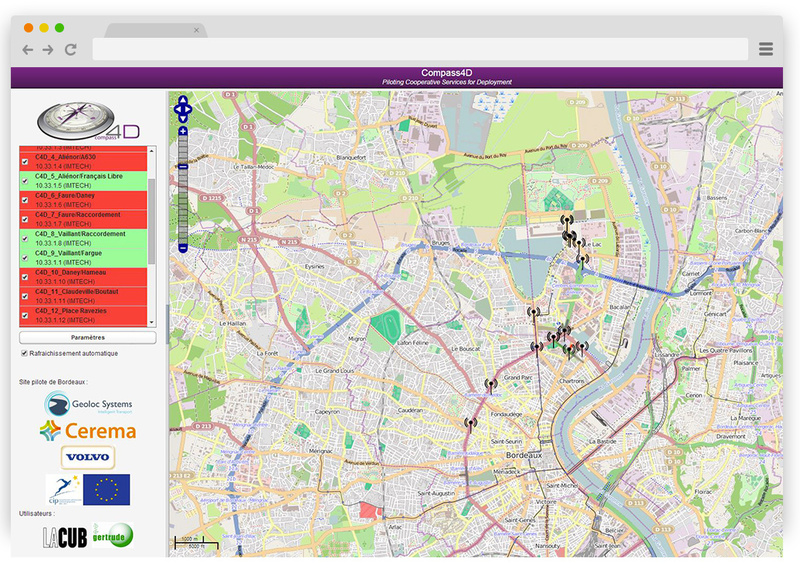 The C-ITS solutions permit vehicles to communicate between each other but also with the infrastructure. They improve security but also energy efficiency and CO2 reduction. 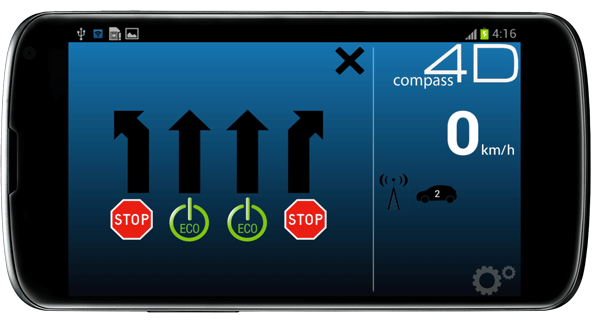 GLOSA is a service which indicates to the driver the optimal speed permitting to have a green light. It is quite easy, when your car is about 300 meters away from the traffic light, it will send the speed advice at which you should drive in order to reach the light at green. Like this, you will consume less fuel, CO2 and your global driving time will be lower. This information is provided through an intuitive smartphone application. When your car stops at a red light and it is equipped with the start/stop idling option it is sometimes frustrating to have to re-start the engine just a few seconds after you stopped. Furthermore, stopping the engine is profitable if it lasts more than 7 seconds. Our smartphone application will tell you if it is worthwhile to cut the engine. This will be the case if the time to green is superior to 7 seconds. 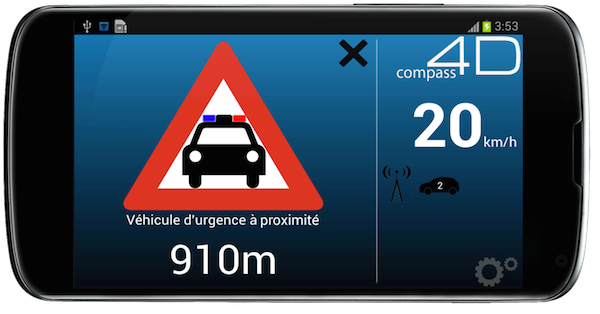 When an emergency vehicle belonging to the fire department from Bordeaux and equipped with COMPASS4D approaches and is on intervention it will send an alert signal which can be received by another vehicle equipped by COMPASS4D. An alert message saying that an emergency vehicle is approaching will appear on the smartphone. 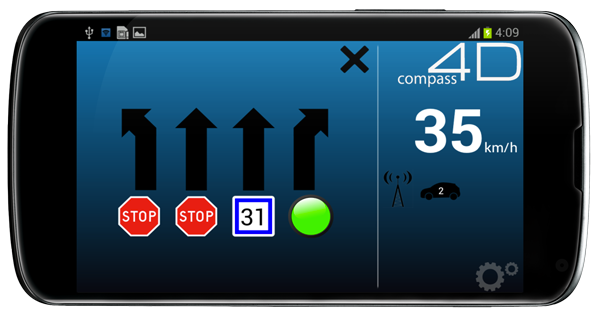 You will receive in real time road events located on the ring road of Bordeaux. Accidents, traffic jams, roadworks, incidents, weather events are part of the numerous types of events managed and provided by the Traffic Management Cystem TIPI managed by the CEREMA dTerSO and the French Ministry of Transport (Medde). 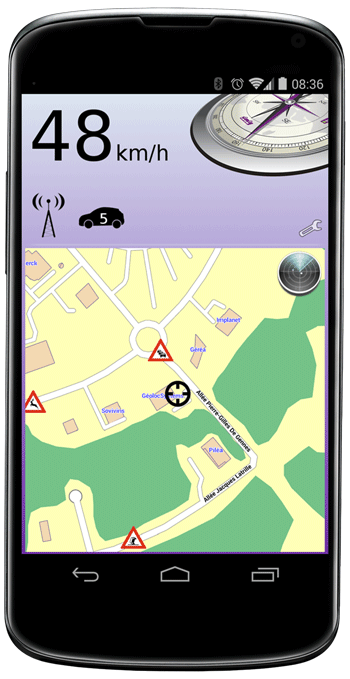 The smartphone application proposes 3 views (map view, radar view, proximity event alert). This FULLWEB platform permits the management and supervision of all the elements used for the operation of cooperative systems in Bordeaux. Especially the supervision of the Road Side Units and On Board Units but also the connections with the different data servers like TIPI for the road events and GERTRUDE for the information concerning the traffic lights. Another module permits the management of statistics and the evaluation of the efficiency of the system.